Available in a one-ounce format, the Palladium Maple Leaf presents an alternative to the Platinum Maple Leaf. 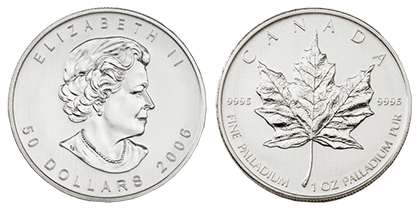 Considered the most popular palladium coin in the world, Palladium Maple Leaf coins are included in the primary line of coins issued by the Royal Canadian Mint. These stunning palladium coins are produced in limited quantities and generally sell out quickly after their release date each year. Palladium Maple Leafs are a valuable addition to any investment portfolio. Made of .999 fine palladium, the Palladium Maple Leaf has unmistakable purity and is artistically executed. The coins weigh one troy ounce and display the iconic image of Queen Elizabeth II on the front or obverse, and Canada’s national symbol, a lone maple leaf, on the reverse of the coin. With a legal tender value of $50, Palladium Maple Leaf coins are the only legal tender palladium government-minted coin.